Will Foodwaste Recycling Succeed in Princeton's Public Schools? Since then, plastic bags (presumably compostable plastic) of foodwaste have begun to show up in the bins. The opportunity here goes beyond saving some money by reducing the amount of trash headed for the landfill. One of the biggest lessons kids can learn is the cumulative power of our individual actions. Each individual's impact seems too minor to be concerned about, but if multiplied by everyone else doing the same thing, the result is game changing. Though this philosophy is drilled into athletes, it's in everyday life that the game is being played for keeps. The cumulative impact of individual actions--like recycling, voting, and how much carbon we pump into the atmosphere--determines what sort of future we will share. If one student throws non-compostables in the cafeteria compost bin, the custodians are likely to toss the whole contaminated bagful into the trash, sabotaging everyone else's efforts to make the system work. Everyone has to assume responsibility and pitch in. Foodwaste recycling will be toughest at the high school, where students are allowed to eat lunch anywhere in the school. That dispersion and general lack of supervision makes it all the more important that an ethic of recycling be promoted and sustained, lest cynicism grow about whether the high school's recycling program is actually functioning. What I've heard from conversations with staff fits with my experience back in 2007, while helping get recycling restarted at the public schools. Success is most assured if there's someone at the bin in the schools' cafeterias, ingraining new habits by making sure students throw their scraps and other waste in the right bins. This is essentially the role a coach plays with a sports team. The compost bin needs to be paired with the recycling and trash bins, so students don't have to walk extra steps. Signage has to be clear, both in word and, for those too distracted to notice labels, the "body language" of the containers. There has to be monitoring out back to make sure the after hours custodians aren't just throwing everything in the trash dumpster. To overcome cynicism, there needs to be feedback and updates so students have some assurance that what they are dutifully throwing in the recycling bins is actually getting recycled. Because it's so easy for recycling programs to fall apart over time, someone in each school with passion for recycling needs to be designated to monitor the program over time. Above all, the administrators have to lead, to send a message repeatedly to staff and students that recycling matters. Otherwise, everyone will take silence to equal indifference. Recycling is not something peripheral to the educational experience, but central to the individual's understanding of his/her place in the world and impact upon it. It's a habit students can learn and carry with them for a lifetime. In sports, there's a coach, and someone keeping score. Recycling is essentially a sport being played without any ongoing coaching for the individual players, and without a score at the end of the week (e.g. pounds of foodwaste diverted from the trashstream) that people can take pride in or work to improve. More tips on making recycling work in the workplace can be found at this link. For information on how foodwaste may in the future be hauled to Trenton for composting and biogas production, rather than to the current composting site an hour away in Wilmington, links here and here are a start. How nice. A snowkangaroo (best guess) in the park. But wait a minute. Isn't it the kids who are supposed to be building the snowbeings, not the parents? Really kids, you can't expect the parents to house, feed and clothe you, drive you to school, and then go to the park and play for you as well. It's too much! So come on kids. Time to step up. Put down those cell phones, find some boots and mittens, step outdoors and get busy. If you haven't done it for awhile, don't worry. It's just like riding a bike. Our pediatrician called the other day to give advice on whether our daughter should get vaccinated for Class B Meningitis at Princeton University. The answer was an emphatic yes. Turned out the pediatrician's son was one of those who contracted the disease this year. It's a serious disease, with a ten percent mortality rate even when treated. It can take weeks or months to recover. Also from our pediatrician: The vaccination is given in two doses, with one given Dec. 9-12 and the other in February, 2014. There are fewer cases of Class B meningitis in the U.S. (200/year) than elsewhere in the world, which is one reason why the vaccine has been approved in Europe but not yet here. The vaccine has been well tested abroad and is truly not experimental. An interview on the radio program Here and Now answers many questions relevant for Princeton. The University of California in Santa Barbara has also had an outbreak, with four students getting sick, one of whom had to have both feet amputated. The doctor interviewed said that the campus outbreaks are related to the crowded conditions typical to any campus, and that there is little threat that students will spread the disease outside of the campus environment. The CDC and state health officials recommend that classes and activities at Princeton University continue as planned, and the surrounding community can continue to attend events on the campus. They do not recommend any travel restrictions for members of the University community. The bacteria are not spread by casual contact or by simply breathing the air where a person with meningitis has been, and there is no evidence to suggest a risk of spreading the bacteria by touching surfaces. For frequently asked questions about the University vaccine clinics, including specific questions for students, faculty, staff and community members, please visit: http://web.princeton.edu/sites/emergency/meningitis.html. For frequently asked questions about the vaccine and bacterial meningitis, please visit the CDC's meningitis information website: http://www.cdc.gov/meningococcal/vaccine-serogroupB.html#serogroup. "Student filmmakers ages 12-24 you may now submit entries to the 2014 Princeton Environmental Film Festival (PEFF) NEW short video contest. Make & send videos that focus on sustainability, its related topics, and life perspectives. Videos can be serious, thoughtful, or comic, and will be judged on their creativity and uniqueness. They should be under three minutes long. Selected videos will be showcased at the PEFF (on Saturday Feb. 8, 2014 ) and one grand prize winner will receive a GoPro Camera." When my daughter needed a new backpack for school, she wanted one similar to her older sister's, but the online store was out of the desired color. The internet had failed us, but the local Kurbside Kmart came through. With uncanny serendipity, a backpack with the same make and desired color appeared on the curb just around the corner from our house. It looked fine, but we soon discovered a problem. One of the zippers wouldn't zip. The teeth didn't close behind the zipper but remained open. I went to our handy local Sew Vac Center (three blocks away at the Princeton Shopping Center) and bought a zipper and some thread. While searching the web for insights into hand-sewing zippers (a daunting task), I came across a youtube video that showed how to fix the old one. One well-aimed squeeze of the pliers was all it took to make the zipper work like new again. I made this simple fix several weeks ago, and the zipper is still working. A nice sighting on Hodge Road. Watch out for those speedhumps! Where's Hodge Road? The glut of streetname-worthy personages in Princeton's history has caused many streets to adopt a Zelig-like quality of switching identities every couple blocks. Hodge Road begins its life in the eastern lowlands as Tyson Lane, but quickly grows restless during its slow climb, abandoning that name after only one block in favor of Littlebrook Road, then quickly changing names again, becoming Rollingmead Street. Its passage across the threshold of Snowden Lane seems a fitting time to adopt yet another alias, Hamilton Ave, perhaps to better fit in to a neighorhood populated with Harriet, Hornor, Harrison and Hawthorn. This Hamilton persona continues for a surprisingly long stretch before the street--excuse me ... Avenue--gives in to old impulses and flirts for a brief time with the name Wiggins Street. At Witherspoon, it senses another historical shift and takes the proud name Paul Robeson Place before settling on Hodge Road for its final blocks. Hodge ends at Elm Road, which if you turn right will soon become the Great Road, whose greatness may not be clear in the eye of the beholder. Some have speculated that the tradition of name changing could have played a key role in confusing the British during the Revolutionary War, and has served to intimidate potential invaders, and benign newcomers, ever since. With the development of GPS by government researchers, New Jersey and Princeton in particular has lost this protective web of confoundment. While traveling from Tyson to Hodge, you may as a Princetonian of highly advanced discernment wish to point out to fellow travelers the subtle differences in road width, surface texture and overall bearing that distinguish a Lane from a Street and an Avenue from a Place. Also, a tip for those lost and searching for a particular street in Princeton: just keep going straight. You'll probably find it. Reducing one's carbon footprint is not usually associated with big fun, but the idea is to uncouple fun from consumption of fossil fuels. The holiday season is upon us and with that comes parties, festive packaging, decorations etc. Ever wonder how to stay green amid all that tinsel? Join Sustainable Princeton’s Green CORE (Community Outreach & Resident Engagement) and share ideas and find out more. The Whole Earth Center is located at 360 Nassau Street, Princeton, to learn strategies and tips on how to keep events green without sacrificing style or breaking the piggy bank. One day, a scavenged rake handle--tineless, alone in the world, feeling unloved and useless--met a beautiful red rake that too had lost its mate and then narrowly escaped a one-way ride to the landfill. They stood shyly next to each other in the garage for what seemed like months, until the handle, transPortered by the rake's perfect symmetry, could not contain itself any longer and burst out singing, "But if baby I'm the bottom, you're the top." When he got to the part about how she was "the smile on the Mona Lisa", she could resist no longer. Thousands of leaves danced at their wedding in the sweet autumn afternoon. They've been happily married ever since, and each year look forward to starting a new leaf pile on its way to maturity. This was posted earlier at one of the companions to this blog, PrincetonNatureNotes.org. A recently completed tree inventory suggests that Princeton could end up losing ten street trees for every new one planted in coming years. 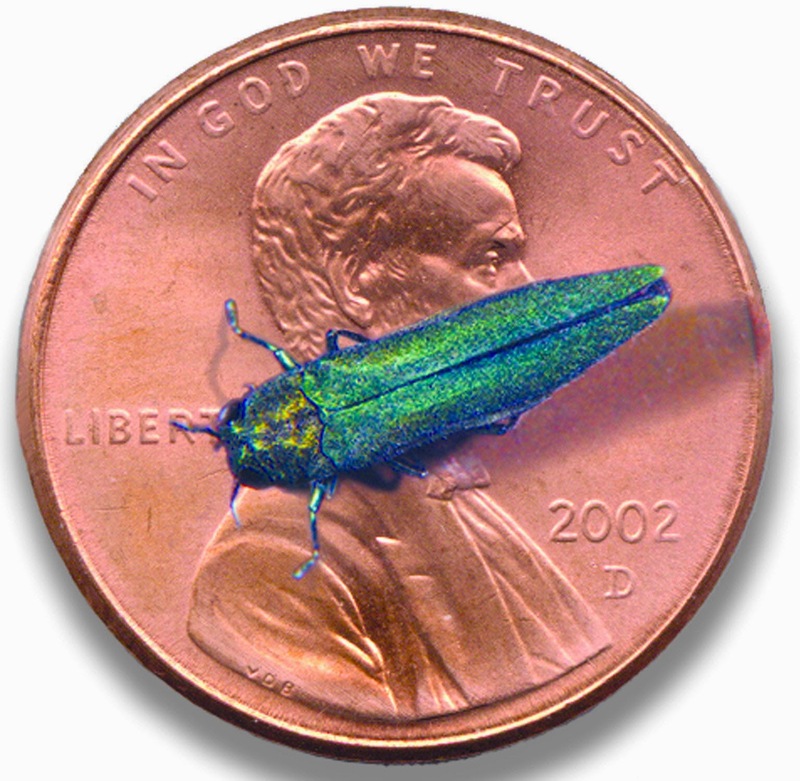 As chance would have it, the original EAB infestation occurred just north of Ann Arbor, MI, where I used to live. The city of 100,000 had to spend $5.8 million removing 10,000 trees. Interestingly, Ann Arbor's arborist told me that ash continue to sprout in the woodlands there, and can grow to 6 inch diameter, but the chances of their growing to maturity are slim. Princeton has dealt with threats to trees in the past. A bacterium called Bacillus thuringiensis (BT) has been used to reduce the impact of gypsy moths--also an exotic insect. According to Greg O'Neil, Princeton's arborist, the wooly adelgid's attack on our eastern hemlocks was slowed down by pesticide, after which the pest appears to have "cycled through", allowing many hemlocks to survive. The big question is how to replace so many trees with a limited budget. The more gaps in the street canopy, the more pavement is exposed to the sun, which through the "heat island effect" causes the town to be hotter than it need be in the summer. At $200 each, new trees aren't cheap, and then there's the planting and followup care to insure they survive. I'd say "Get thee to a votary! ", but it turns out that a votary is defined as a monk or a nun, and they probably aren't working at the polls. October 16 was a good practice run for today's election. Having watched a few baseball games over the years, I had come to believe that it's over when it's over. This looks over to me. The American Water Company proactively replaced an old water line in our neighborhood, then laid down a nice patch along the middle of the street--a street that looked to otherwise be in good condition. The street, like a dental patient, had received a filling. There seemed no need for an expensive crown. But no, I was wrong. It's not really over until the fat lady sings, in this case the fat lady that chomps a few inches of asphalt off the street. some of whom looked like they hadn't changed much since World War II. After a couple days of hefty labor and ponderous groan, they moved on, leaving a gloriously paved street in their wake. Beautifully done, and looking at it from the narrow perspective of a neigborhood, it's pleasing to have it done. American Water says it's all part of replacing the water lines. But taking a larger view, surely there are streets elsewhere, crumbling, plagued with potholes, in greater need of care. If most teeth can function long and well with minor patching, then why not streets? At least on the surface, it seems like a big production for little gain. I know not why the fat lady sings. No tricks or treats here on Halloween. There was a beautiful house with Frank Lloyd Wrightian lines here, and now it's gone. The great beasts of demolition are only supposed to devour nondescript houses, not those with style. Most houses pegged for replacement in Princeton suffer a decisive and violent, machine-mediated end. If not a wrecking ball, then a massive claw chomps away at its fabric until all lies in a heap, to be carted away before anyone can notice, or recall what used to be in that sudden void. So it was surprising to be passing by this long neglected house one day and see several men hammering at its chimney, with a pile of bricks and debris slowly accumulating on the ground. I asked what was up, and the supervisor told me they had decided to take the house apart piece by piece--for the neighbors' sake. They also seemed to think it was cheaper. After the chimney was taken down, the walls were stripped off. Seeing all that fine wood on display, my hunter-gatherer ancestry kicked in, and the question was posed whether I might obtain some of the lumber for a little project I had cooking. There were in particular 16 or so long 2X6 cross braces in the attic, free of naily bones, that looked like they could be easily trimmed from the carcass like a fish fillet. Not only would the wood be saved from disposal, but it would also likely be of finer quality than what's available these days. The situation brought back memories of Ann Arbor in 1977, when U. of Michigan's giant Waterman-Barbour gym was pegged for demolition. Built 80 years prior, with separate gyms for men and women, it was, at least in the 70s, the scene of many a pickup basketball game, with what seems now an unlikely diversity of ages and backgrounds, including some Sioux Indians, who were puzzled when I showed up one day without my ponytail, as if they thought I had cut off a piece of my soul. The gym was cavernous, the inner space rising up and up to a long skylight--the sort of building one is more likely to encounter now in dreams that in the waking world. When we heard the great building was coming down, some artist friends and I asked if we could rescue some of the gym flooring for a dance studio in our third floor downtown loft. We worked quickly, motivated by the wrecking ball that was crashing against a not all that distant corner of the building. There was less worry about liability in those days. The dance floor proved a success, though the loft, too, was later demolished in the real-estate bubble of the 1980s. But back to the house on Hamilton Ave. The supervisor was at first enthusiastic with the idea of recycling the house, or at least parts thereof, but a week or so later he balked, offering what sounded like a prefabricated excuse. One can only do so much to shift the throwaway culture. After the about face, there was nothing to be done than to watch the slow motion fall, which in fact just took a few days. In any situation like this, the contractor's goal is to deconstruct as quickly as possible, then have the remains whisked away. Recycling is seen as an unnecessary complication. Without strong incentive to reclaim the wood, it just gets chopped up and stuffed in a dumpster. Presumably, the carbon in the wood will be sequestered in a landfill, for what's that's worth. The strategy here was to save the basement, foundation and the floor joists, then build a new house on top. Additional basement space was added towards the back, so the new house will be, of course, bigger. It only takes a day for another floor to be added to the skeletal structure. Though the recycling dream grew, then burst, the revelation remains that an old, unwanted house can in fact be dismantled by hand, in the process employing many workers and raising at least the possibility of reuse. Practical ways to save energy and money: 7pm tonight at the Princeton Public Library. Looks like a good lineup. 1. Attend a Panel discussion on Home Energy Savings: OCTOBER 29, 7:00 p.m. at Princeton Public Library in the Community Room titled: "Get EnergySmart: Practical Ways for Princetonians to Save Energy and Money," Speakers include: Edward T. Borer Jr., Energy Plant Manager, Princeton University; Heidi Fichtenbaum, LEED Accredited Architect, Farewell Architects LLC. ; Scott Fischer, Founder, Ciel Power LLC; Sandra Torres, Director of Outreach, Tri-State Light and Energy Inc., and Rees Keck, Founder, Potential Energies. This event is free and open to the public. 2. Sign Up for a $49 Home Energy Assessment: Sustainable Princeton negotiated for $49 energy assessments (half price) for local residents. Our goal is to have 100 residents sign up for energy assessments over the next year. Our Energy committee vetted a number of possible energy providers and chose Ciel Power LLC, which has successfuly worked in both Woodbridge and Highland Park to lower energy consumption in those towns. All sorts of energy rebates are available if you choose to make fixes to your home based on the assessment. Go to Cielpower.com to sign up (Princeton residents get a $50 discount from the stated price of $99), or to learn more. Only one race will be decided, but it's a biggie. This fall, rather than dump leaves in the street or stuff them in bags, consider these options. The easiest option by far is to mow the leaves back into the lawn--an approach recommended by county extension offices around the country, and even by company sites like Scotts Miracle Grow. They've studied it, and concluded that the ground up leaves provide valuable fertilizer for the lawn, and do not cause any problem with thatch. Some kinds of leaves make this method particularly easy. Pine needles and honey locust leaves are so small they don't even need to be chopped up by a mower, or can be raked underneath shrubs to serve as a mulch. Leaves of silver or red maple also tend to "melt" back into the lawn, decomposing quickly. This will take care of leaves the lawnmower can't reach. Electric leaf blowers are quieter than the gas varieties, and some designs can be reversed to vacuum up leaves and grind them. I have not tried this method, but the NPR show You Bet Your Garden had a segment singing the praises of leaves ground up this way as mulch for flower beds. Even if you buy locally, you can check out reviews of various brands here on Amazon, with prices well under $100. If you choose to collect leaves into piles rather than grind them, the question becomes where to put them if not on the street. One factor that makes people more likely to blow leaves out to the street is that most yards lack "rooms." The typical yard has shrubs pushed against the house and fenceline, defining only one sprawling "room" that extends uninterrupted to the curb, all of which is then required to be ornamental. Houses have rooms that separate utility and storage from living areas, so why not yards? 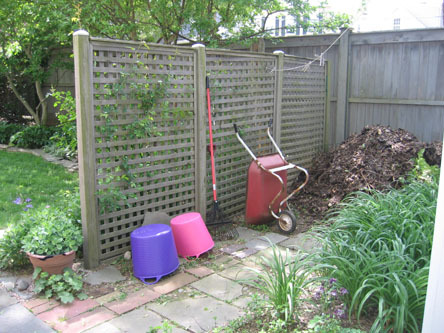 If you use shrubs or wooden walls to define and screen small utility areas in the yard, it becomes very easy to store leaves while they decompose and slowly return to the soil from which they came. Nature's miraculous trash-free economy is then allowed to function, and we're spared a big mess in the streets and the considerable municipal cost of hauling, grinding and mechanically turning leaves at a distant composting center. The photo shows one such configuration in a friend's backyard. The wall provides screening between the utility area with compost pile and tools, and the ornamental garden to the left. Another way to break up space and screen a leaf pile from more ornamental areas is to plant shrubs out a distance from the fence. The leaves can then be piled inbetween the shrubs and the fence. Though a back corner is the most logical location, the one in the photo is next to the street. Here's the view from the street. The shrubs are privet, but a native evergreen alternative would be inkberry (Ilex glabra). Other smaller native shrubs--not evergreen but with attractive flowers, would be Itea virginica, Clethra alnifolia or Fothergilla. The main idea is to reconfigure how shrubs of any kind are planted in the yard, so as to create refuges for leaf piles that will quickly be flattened down by the weight of rain and snow and benefit shrubs and trees through the steady process of decomposition. Sectioning off a "room" in the yard also breaks up the monotony of shrubs lining the fenceline and foundation. Whether ground up or piled in a corner, leaves serve as a natural fertilizer and increase the capacity of the yard to absorb rain. The more organic matter a yard contains, the more moisture it can hold, which helps buffer the yard from extremes of rain and drought. A soil rich in organic matter welcomes the rain, which in turn reduces runoff into the streets and, collectively, the amount of flooding downstream. There are at least three kinds of energy in this photo on Nassau Street. One is the gasoline for sale in the background, the second is the firewood, and a third is something called "embedded energy", which can be found in the solid oak chest of drawers and the 1994 Ford pickup. There are also three kinds of scavenging going on. Two are obvious and above ground: the firewood and the abandoned vintage furniture. The third is both universal and hidden. Civilization as we currently know it is based on a massive scavenger operation, digging up energy and minerals from underground. Each of these kinds of energy and scavenging have global consequences. I always thought of gas stations as just another town business, but seen from the perspective of the planet, they are part of a climate change industry, the impact of which, in addition to the highly convenient aspect of getting us where we need to go, is to liberate carbon from its underground storage. Some would say that burning gas has the same climate consequences as burning wood, but that's not the case. They both release carbon dioxide, but the carbon in each is different. The energy for sale at the gas station is from ancient underground deposits of oil. By the time it gets into the truck's gas tank, a lot of energy has already been burned. There's the exploration, the extraction, the transport to a refinery, the refining, and the transport to the gas station. Gasoline contains strings of carbon left over from ancient life. You could say there's solar energy stored in the bonds between the carbon atoms, but the last time that carbon saw the light of day, the climate and life on earth were very different. Ancient life extracted carbon from the air, then died and settled into the watery ooze. Gravity, pressure, and time all contributed to transforming that ancient life into massive underground storage of carbon in fossil fuel. All that extracting of carbon from the atmosphere over hundreds of millions of years cooled and tempered the climate. To exhume these graveyards of ancient life is to undo the climate in which civilization has flourished up to now. The carbon in the gasoline is still contained, still locked up in chains. In fact, because it's been contained and underground for millions of years, its carbon is different from the above ground carbon that has been getting exposed to radiation from the sun. This difference, found in the relative percentage of carbon isotopes, can be measured, which is how we know that enough ancient carbon has already been pumped into the atmosphere to increase the carbon dioxide level by 40%. It's the truck engine that performs the carbon's liberation, using fire to break the chains and release the wonderful burst of energy that propelled my heavy truck magically up Linden Lane with nothing more than a nudge to the gas pedal. While I'm enjoying such ease, the backside of the truck is quietly sending the ghosts of life and climate-past back up into the atmosphere. That's why I use those machines as little as possible, and that's why the wood is in the back of the truck. The second kind of energy is the firewood. It was a custom in Princeton Borough, when street trees needed to be removed, to leave the wood at the curb, conveniently cut to size, for homeowners to scavenge. That custom apparently lives on, at least occasionally, post-consolidation. For those of us with wood stoves, this free heat provides a way to limit how often the furnace kicks on. Now, doesn't burning wood also release carbon into the atmosphere? It does, but that carbon was already part of the above-ground system, part of the present era's climate. The trees pulled it out of the atmosphere, stored it for 50 or 60 years, and the wood stove returns it. This is a cycling of carbon, not a linear movement of carbon from deep underground storage up into the atmosphere. The alternative to burning the wood is to have it chipped up and trucked out of town for composting. A useful product is created, but that highly mechanized process, which includes mechanical mixing and remixing during the composting process, uses more gasoline, and the wood's carbon still gets released back into the atmosphere through the "slow burn" of decomposition. Though there's some air pollution associated with burning wood, the highly mechanized composting alternative also pollutes, and a well-tended wood stove is far cleaner than a fireplace. To collect firewood in the neighborhood, then, actually reduces climate change by reducing the fuel used to truck and compost the wood outside of town. The wood, then, could be called "today's energy", as opposed to the ancient energy from underground, and it is "local energy", gathered nearby as opposed to whatever distant locale the gasoline comes from. It is also energy that didn't require industrializing some landscape, in stark contrast to oil drilling and fracking. Harvesting the wood from a tree also allows a chance to celebrate the tree's life, to participate in a transformation from sadness to joy. Princeton has been losing a lot of red oaks and pin oaks to a disease called bacterial leaf scorch. To ram the remains into a giant chipper and haul it all out of town, there to mix anonymously with all the others, is to give short shrift to this tree's long life of giving shade, beauty and habitat to a Princeton thoroughfare. Splitting up the segments for firewood, the massive trunk laying there on the curb, is to experience something of what Eskimos must have felt, harvesting the life-sustaining blubber of a beached whale. The rich texture and color of the grain reveals itself with each new split--too beautiful for firewood, but no one is there to turn it into furniture. The back of the pickup truck fills with the promise of a future celebration of the tree's life, in the beauty of the flames and the radiant warmth on a winter evening. Embedded energy, the third type in the first photo, is the energy that went into making things. For the pickup truck, there was the energy to build it, to mine the iron ore, manufacture and transport all the parts, plus the miles the employees drove to work, the heating and cooling of the factory, on and on. The chest of drawers also took energy to build, and to consign it to the landfill would be to lose the product of all that energy. As with the firewood, there is an aesthetic aspect to this rescue of crafted wood: the beauty of the grain, the authenticity of solid wood, and the pleasure of rescuing something from premature demise. The same impulse is central to the artistic process, which fashions beauty out of experience and the materials at hand. The truck and oak chest, though, require a fourth kind of energy to survive. That would be the energy to repair--a very special kind of human energy that comes partly from the metabolism of food and partly from the mysteries of the heart and mind. We all have it, but it can remain dormant for days, months, or with some projects, years, stifled by the abundance of new products, or a lack of time, parts, focus, ability or confidence. It involves courage to take on entropy, which seeks to unravel all things. That is the world as seen from the back of a pickup truck parked on Nassau Street. When fall weather stirs a desire to explore the great outdoors, Princeton is ready with a way to escape cars and claustrophobia along the DR Canal towpath. or waited for the porcelain berry to give up its spot on a bench next to the towpath. The turtles had claimed the best spots for sun bathing. past garlands of Virginia creeper brilliant red. On a previous ride, we had turned left after a mile and a half, taking the pedestrian bridge at the golf course to head over to catch lunch at Whole Foods. and through a beautifully designed underpass, after which the towpath adopts a more open, parklike look. Every good bikepath should consist of a series of destinations, and the next one on the towpath turned out to be Brearley House, run by the Lawrence Historical Society. Some may know Brearley House as the site of the annual New Years Eve Hogmanay celebration, and the bonfire whose flames rise thirty feet before settling down to a deeply glowing mass of hot coals, consuming all regrets from the year just lived. Their website explains that the house was built in 1761 on the "Great Meadow, a farming and grazing land of the first residents of Lawrence - the Leni-Lanapi People." People don't think of the eastern U.S. as hosting grasslands, but some variations in soil and hydrology supported natural grasslands, augmented by the American Indians' use of fire. Radical alteration of the drainage during the digging of the DR Canal turned the grassland into the extensive wetlands we passed on the way in. Returning along the towpath to Alexander Road, we got a drink at the canoe livery, and then headed home. Next ride, maybe all the way to the bridge over Route 1, beyond which I hear are even more beautiful, bike-friendly stretches of the towpath. As Yogi Berra, the famous installer of urban water mains, once said, "It ain't over 'till it's over." The sound of yet more heavy equipment groaning on a nearby street yesterday meant that the climactic overnight repair blitz the other night had segued into a surprise encore. I went out and got the lowdown from the American Water supervisor about the water lines that run beneath the fair streets of our fair town. He said they would have finished the other night, but they had been slowed down by careful digging in the vicinity of a high-pressure gas line that turned out not to exist. Though no alligators have been found beneath Princeton's streets, that I know of (now that would be a scoop), there are a slew of pipes, and sometimes the various utilities forget where they put them all. Each year, they choose some more water lines in Princeton to replace. There are several reasons for this gradual updating. The pipes here on Horner (one of the founding families of Princeton, by the way) are probably 60 years old, and are made of cast iron. Because cast iron reacts with the chloramines that are used to disinfect our drinking water, the new pipes are lined with concrete in order to prevent contact with metal. The pipes are also laid in a bed of gravel that will reduce the stress on the pipes from the ground's shrink and swell. The new 8" pipes replace the old 6" ones, meaning more water flow capacity, just in case anyone wants to pour more drinking water on the lawn. The supervisor proudly pointed out that no one loses water service during these updatings. Because the water lines form an interlinking network under our streets, the break in the water line during replacement doesn't affect anyone's water access. The water is simply "backfed", which means it flows in from the other end of the street. The water lines, like the streets, allow flow in either direction. At the same time, the company is replacing water meters for each residence. The foreman explained that two-income households make it harder to access indoor meters during the day for monthly readings. The new meters transmit their information wirelessly to a meter guy driving down the street. Within a few years, they may put antennas on the tops of water towers, and simply collect individual meter readings that way. There's a gain in efficiency but also a reduction in workforce needs. It would be nice if these boring jobs like reading meters, once phased out, could be replaced by more interesting and useful jobs, but I don't think business works that way. Anyone arriving late for Christopher Eisgruber's installation as president of Princeton University last weekend would have encountered a scene reminiscent of a yard sale, with a few fans, clothesracks, and a tiger or two still lingering in front of Nassau Hall. Another reason for arriving late was that I knew that Eisengruber's speech could be found online. From the deserted bandstand, with a little imagination I could still hear the kettle drums stirring a sense of gravitas and even courage in all who managed to get there on time. It was less satisfying to imagine the lavish buffet, which had dwindled to a few green apples and the dregs of ice tea. with a few chestnuts to take home, cure for a week and then boil or roast. Even latecomers can reap rewards. The move towards local food at the university has yet to lead to foraging on campus grounds, as I did back in the 70s, when a food workers strike at my college led me to discover the edibility of violets growing outside the dorm. I finally caught up with the post-installation party at Blair Courtyard. Princeton's reputation for feeding its students very well didn't fit with the extremely long and extremely slow line for food. and standing in line is a lot easier when the music of Grace Potter and The Nocturnals is floating out over the green. Potter had a fine protege in the audience. With a daughter just off to college, I was moved to memories by this scene of a proud father filming his daughter from a makeshift seat.